That year is approaching — the one where your soon-to-be 13 year old (or 12 year old in some communities) will become a Bar or Bat Mitzvah. 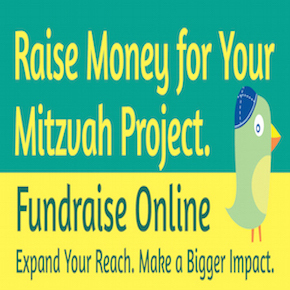 Along with the never-ending to-do list— lessons with the Cantor or Rabbi, the speech, a party, decisions about the guest list, there is that one other obstacle — THE MITZVAH PROJECT. In too many families, it is actually the dreaded Mitzvah Project! Ellie S. surrounded by the Birthday in a Boxes she and her friends prepared for Family to Family’s program that provides parties for kids who might otherwise not celebrate. After more than twenty years of work in the tzedakah world, often guiding parents and kids on their Mitzvah Project journey, I can say for certainty that this seemingly simple task has evolved into something rather different from the idea that first took hold a few decades ago. For too many kids THE PROJECT has become a rote exercise, something on the check list, much like ordering party giveaways or addressing invitations. Too often, projects become a hasty one-time event collecting specific items to donate or soliciting funds for a specific cause. As Marnee Spierer, a Scottsdale mom of 12 year-old Ellie, recently shared, I always thought the concept of a ‘mitzvah project’ was an interesting one – doing a project just before a Bat/Bar Mitzvah felt weird to me. I always thought that becoming a bat/bar mitzvah should be an introduction to life-long “mitzvahdom”. We agree with Marnee’s perspective — doing the project for only the sake of the Bar or Bat Mitzvah event just doesn’t seem right. Don’t we want our kids to see this as the beginning of a lifelong commitment to mitzvot and tzedakah? 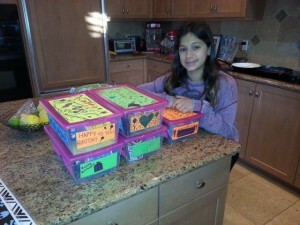 Ellie launched her Bat Mitzvah project on her 12th birthday when friends gathered to assemble “birthday boxes” for kids from rural communities who might not otherwise celebrate their birthdays with all of the traditional trappings. (Ellie and her mom learned of this project through one of our grantees, Family to Family, which encourages people to ease hunger and poverty by sharing their bounty with people in our country’s poorest regions.) The Spierer family’s goal is that each month Ellie will engage in similar activities geared to help people who are less fortunate. Far from a “one-shot” deal, the values this year’s activities engender will no doubt be lifelong. 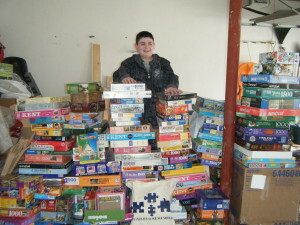 Max Wallack from Puzzles to Remember right after his Bar Mitzvah surrounded by some of the hundreds of puzzles he collected from generous donors. Max Wallack also turned his Bar Mitzvah project into a transformative effort that continues even today as he approaches college graduation and Harvard Medical School. Max grew up with his great-grandmother living with his family. As Alzheimer’s disease ravaged her memory, Max did some research and learned that puzzles are an effective therapy for people living with dementia. 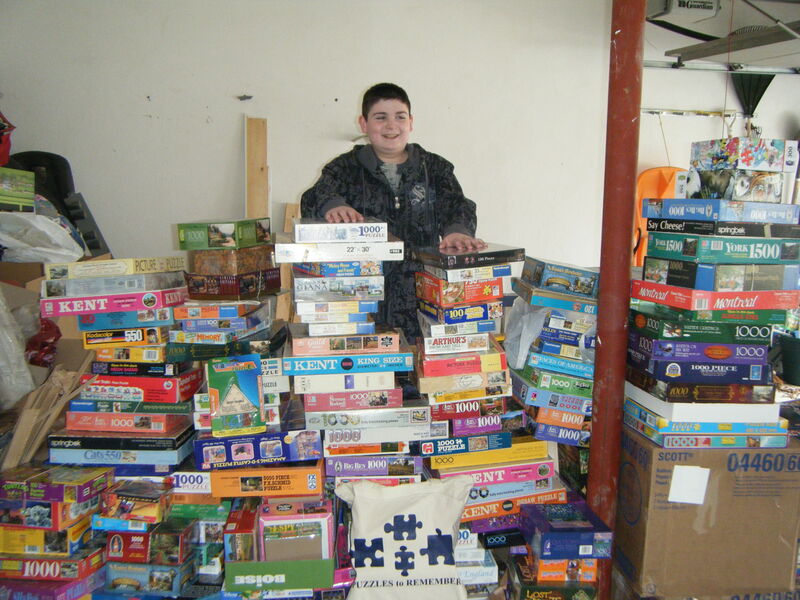 For his Bar Mitzvah project he set up collection boxes around town and invited people to donate boxed puzzles which he then delivered to local nursing homes for elders to use. From that first collection, Max’s idea grew and soon he incorporated Puzzles to Remember, now a US non-profit organization that provides puzzles to facilities caring for patients with Alzheimer’s and dementia. In addition to collecting puzzles, Max approached the country’s largest puzzle manufacturer who agreed to produce more age appropriate large-piece puzzles specifically for such patients. 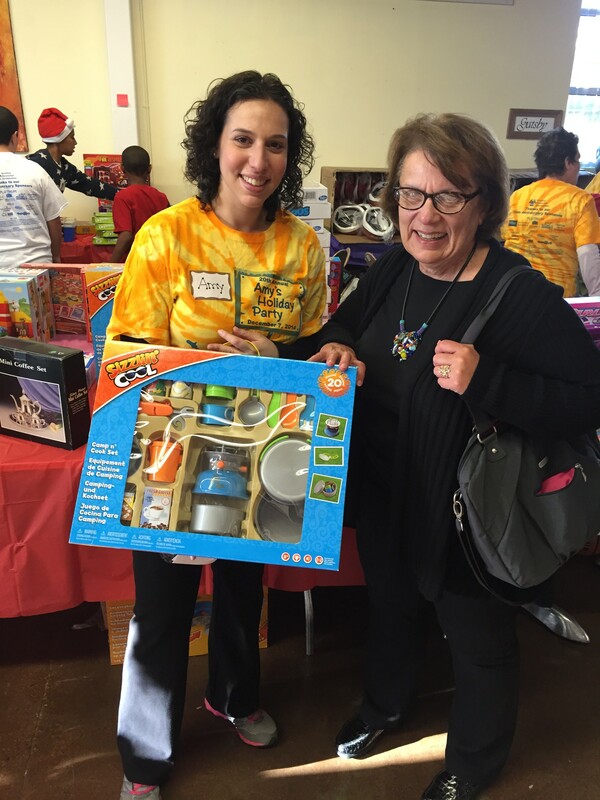 At the age of 12, Amy Sacks (now Amy Sacks Zeide) of Atlanta was stunned to learn of the theft of holiday toys at a local shelter. She immediately donated some of her own money to help replace those toys and the next year, as a Bat Mitzvah project, organized Amy’s Holiday Party which gathered kids from local social service agencies and offered them a fun day ending with the gifting of toys and games. Now more than 20 years later, Amy’s Holiday Party continues under the aegis of Creating Connected Communities, the non-profit organization that Amy started over five years ago to provide local teens with leadership training skills and social action skills. Thousands of kids have benefited from the ideas Amy began to cultivate as she approached her Bat Mitzvah in 1994. Max, Amy and Ellie had no special skills that allowed them to go beyond what might be the typical mitzvah project. What they did have was a passion for helping others and an attitude that clearly included “I can do that.” Kids can change our world. In fact, I often say that sometimes they are the best ones to do it because they don’t dwell on the reasons why something cannot be done…they just do it. Challenge your kids long before their 13th birthday pops up on the calendar. Ask them what they like to do; what they are good at; what in this world makes them angry and want to shout about. When you get the answers to those questions you are on the road to a meaningful, life-changing mitzvah project! Naomi Eisenberger co-founded the Good People Fund in 2008. 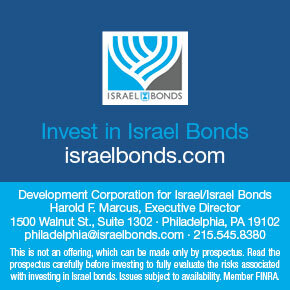 Inspired by the concept of tikkun olam or repairing the world, the fund provides financial support and mentoring to small grass-roots efforts that alleviate significant problems such as poverty, disability, trauma and social isolation, primarily in the United States and Israel. https://www.goodpeoplefund.org.